Tony Whedon’s new book The Hatcheck Girl vividly describes border crossings where language, culture and states of consciousness collide. In these richly layered poems about jazz most of the musicians we meet are sidemen: few are famous, most are notorious. They’re united, as he says in his opening poem “The Tradition of the New,” by their devotion to the music and by their appetite for a note, a phrase to “make it new . . . over and over.” Whedon is a poet of historical juxtaposition: in “The Peacocks” we meet both trumpet player Chet Baker and Italian Baroque painter Michelangelo Caravaggio on a lonely beach outside Naples. In “Head Wound” Whedon’s narrator, an expat jazz musician who’s suffered a head wound in WW II France, contemplates the beauty of late-14th Century illuminated manuscripts. 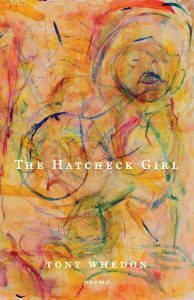 Some poems in The Hatcheck Girl feature women – Whedon’s opera singer sister dying of cirrhosis in Manhattan, an aging torch singer in Jacksonville, a young, green female pianist in Paris – struggling to survive in a male-dominated art form. Others depict the lives of musicians who scuffle for gigs in out-of-way clubs because they both love the music and don’t know what else to do. Robert Pinsky has praised Tony Whedon’s “masterful verbal music,” and in The Hatcheck Girl Whedon, a jazz trombonist, is in command of the medium. His new collection is full of brilliant improvisational surprises. Tony Whedon is the author of the poetry books Things to Pray to in Vermont Press and The Falklands Quartet, and the poetry chapbook The Tres Riches Heures. His poems and essays appear in Harpers, American Poetry Review, Iowa Review, Prairie Schooner, Sewanee Review, Ploughshares and over a hundred other literary magazines. His essay collection A Language Dark Enough: Essays on Exile won the Mid-List Press award for Creative Nonfiction. Tony is a working trombone player and the leader of the poetry/jazz ensemble PoJazz. 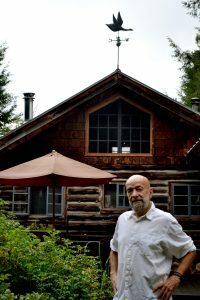 Along with Neil Shepard, he founded Green Mountains Review. He lives with his wife Suzanne in Montgomery, Vermont. ORDER AT ONE OF OUR FAVORITE VERMONT BOOKSTORES!